Adam Murray feels that new loan signing Mani Dieseruvwe can be a huge part of his play-offs jigsaw this season with one eye on next year when the giant striker is out of contract at rivals Chesterfield. The 6ft 5ins, 21-year-old arrived at the One Call Stadium today and manager Murray said: “It’s great to get him in. “With the situation we’ve had it’s been a tricky one and, to be be honest, we should probably have done this a month earlier. “As we were doing so well three weeks ago, fifth in the league, you don’t want to break your rhythm up or interfere with the group too much. “Obviously in the last three games we haven’t got the results we desired, though we believe we should have got something out those games. Murray stressed that he feels Dieseruvwe can bring more out of his other players. “We have got a good group,” he said. “It wasn’t necessarily about going out and getting a superstar. It’s about getting a piece of the jigsaw that makes the whole thing better. “What we’ve managed to do is get a very good player as well as a good piece that will make the jigsaw better. “Obviously at 6ft 5ins people will look at him as a target man. He is but he’s not just that. For someone so big he’s got tremendous feet. “He has come from Sheffield Wednesday so he’s had a good upbringing. He has been a prolific goalscorer in the U21s at Wednesday, but not had the amount of opportunities he wanted in League One this season. “Mani has still played a good number of games, and he has been scoring in their reserves, averaging about one a game, so he’s not just a target man. “He’s got goals in him and his link-up play is very good. He has excellent feet and because of his background he is intelligent as well. If Dieseruvwe plays against Portsmouth on Saturday he will be immediately re-united with his former Chesterfield boss Paul Cook. “I think it was Paul Cook who signed him at Chesterfield. We all know Cooky signs good footballers so that bodes well. “He is one we’ve had an eye on for some time. I saw him a long time when he was at Sheffield Wednesday and I always thought he had all the ingredients to do a bit of everything. “At his age Mani has a good hunger to achieve and do well. He has a point to prove as he’s not been playing. Murray felt coming from Stags’ local rivals would not place any more pressure on the new boy. “It’s not really a hurdle,” he said. “If you are a good player, you are a good player. It shouldn’t make any difference. “I don’t think Chesterfield fans would have thought that when they signed Sam Clucas. It’s a nothing really. “You can make it as big or as little as you want. 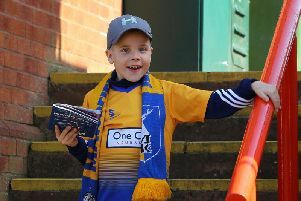 I expect our fans to make him feel at home and welcome and show him how we do things at Mansfield Town. I have no doubt in my mind they will do that. “He is our player now for 10 games and his contract is up in the summer. So I am hoping he will do really well. “He will come straight in and train with the lads today. The way this group is he won’t have any problems with integration. We’ve shown that all season.